This arrived today after a few days of courier pigging about. 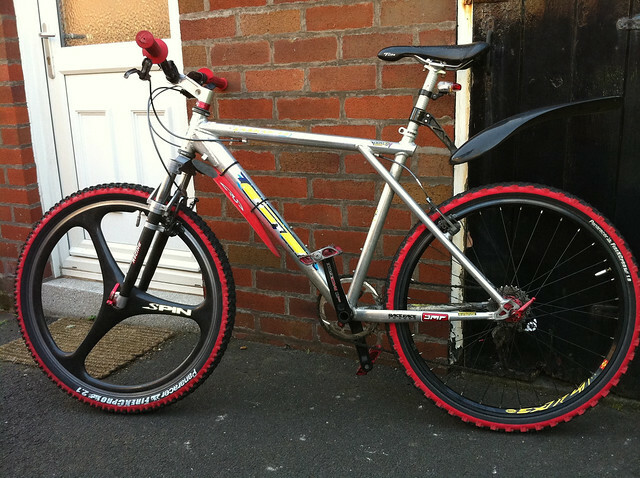 My Trek will serve as a donor though I am going to use a spare post for now while I work out what I want on it. Had to buy a new front mech and seatpost clamp and just short some cables now. Going to try and get it done over the weekend. It is an 18" frame and came with a Push tuned RP23 to go on it. Should be a blast I am hoping. Nice. What year is it? Pulling up a pew..
Its an 09 in gunmetal. Frame seems to have been looked after well and is reasonably free from any nasty marks. Given it a good clean and stuck the shock in and fitted the seatclamp and seatpost. No cables for the gears yet but managed to find the ones that have lasted 22 months on my daily rider now. Hopefully they will show up Monday or Tuesday. Stripped the Trek and got some stuff on today though not without problems. Took the brake hose off the back to feed it through the swingarm after spending 20 minutes pushing some earth cable through first. When reattaching it I managed to strip the threads on the banjo by not paying attention to the angle the hose was going on at. So will have to get one ordered for quick delivery as LBS can't do it. Also headset hasn't arrived yet. BB and chainset are on though and the front mech and also seatpost, seat and clamp. Won't take long as last bits trickle in. Sounds great. If you don't mind me asking what did you pay for it? 650 with the pushed shock. Nearly there. Just waiting on cables. Looks great. Liking the red tints. Ah yes they are great, have some purple ones on the wifes purple Zaskar but sadly they will be too narrow for me these days. The RaceFace SixC that are on them are 725 wide and suit me perfectly. Cheers for the offer though.